Sometimes, when a film truly connects with an audience through its positive messages and uplifting attitude, it can fill you with such hope for humanity. Recent films like La La Land and Arrival became successes exactly for that reason, because not only were they great movies that benefited hugely from word of mouth, but they also contained strong vibes that we as a species, in our increasingly hostile political environment, desperately need right now. 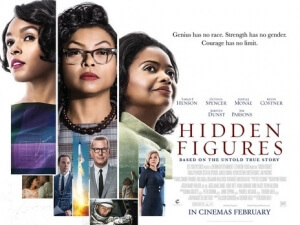 The same applies for Hidden Figures, which has already become a huge hit in the States both with critics and audiences, and has brought to light the story of the people who contributed so much to the NASA space program in the 1960s, yet have never been truly recognised until now. But thanks to a crowd-pleasing mentality by director and co-writer Theodore Melfi (whose previous film was the Bill Murray vehicle St. Vincent), their stories are now officially part of the cultural zeitgeist. In the film, we follow three African-American women that are part of NASA’s human “computers” section in the segregated division on the institution’s Virginia base. They each have their own sub-plots that ultimately tie into their overall contribution to the science and intelligence that helped propel the United States further ahead against the Soviet Union in the Space Race; Octavia Spencer plays Dorothy Vaughn, who seeks to become NASA’s first African-American supervisor as the IBM data processing system comes into fruition; Janelle Monáe is Mary Jackson, an aspiring engineer who must take her case to court when she is denied access to a whites-only adult school to gain her degree; and finally, Taraji P. Henson is maths genius Katherine Goble, who is invited to become the first coloured member of the Space Task Group, and whose natural ability to deduce complicated equations eventually helped astronaut John Glenn (Glen Powell) complete the first American-manned orbit of Earth. Henson is given the most screen-time out of all three, effectively making her the lead, but whatever way you look at it this is very much an ensemble film. All three women are so much fun to watch, whether they’re together and just buzzing with all that chemistry between them, or individually when they are dealing with their own problems in mindful and respectful manners (and between this and Moonlight, is it okay for me to now say I have something of a crush on Janelle Monáe? I think it’s okay to say that now). The supporting cast is great too, with standouts including Kevin Costner being kind of awesome as the Space Task Group director Al Harrison, a fictional composite of a few real-life NASA heads at the time, Mahershala Ali popping up in a fairly small role as Katherine’s future husband, and even Jim Parsons manages to play a scientific egghead and NOT be completely intolerable for once. It’s easy to see why this film recently won the Best Cast Ensemble prize at the Screen Actors Guild awards, because the cast is so strong and likable that they carry the weight of the film on their collective shoulders. But it is also a film that shows just how important unity really can be, and if it weren’t for segregation laws and institutional racism that plagued America in the 1960s, who knows where we would all be today? Melfi and co-writer Allison Schroeder – who has come a long way since writing the direct-to-video sequel to Mean Girls – approach the story as not one of racial divide or persecution, but as one of celebration of what these real women actually accomplished, at a time when it was all but impossible for any coloured individual to progress in any field. The writers represent them as strong-willed and determined individuals whose intelligence and natural talents with math and science are their superpowers, but are also subject to the same kind of emotional downfalls as any other person, which grounds them and makes them human. They also manage to achieve the impossible and make learning about NASA not boring; you find yourself interested in how this particular institute works, and how it relies on pure brain power to calculate the most impossible of trajectories, before computers could come in and effectively rob them of their work. It’s great to see something as potentially uninteresting as NASA be given such a lease of life on the big screen, giving younger people aspirations to gain the same amount of intelligence to eventually join their ranks. It’s very much a crowd-pleasing movie, one that can appear to be too safe when dealing with subjects like racism in 60s America, and one that critics of biopic clichés will probably find plenty to nit-pick here. But even though some of it may seem corny, it’s done well enough to still make you have a good time while watching it, whether it’s enjoying the ensemble performances by its talented cast, or appreciating the direction and writing that make the subject matter all the more interesting and, even more importantly, fun. I can definitely see a lot of people really liking Hidden Figures, as they should; it’s a timely and heart-warming movie that finally gives these people the recognition they deserve. Hidden Figures is an uplifting and heart-warming celebration of the African-American women who helped NASA during the Space Race, combining a wonderful ensemble cast with writing and direction that really makes the institute and the events surrounding it interesting for a wider audience, and making it a genuinely fascinating and entertaining movie for young people to take inspiration from in the future.